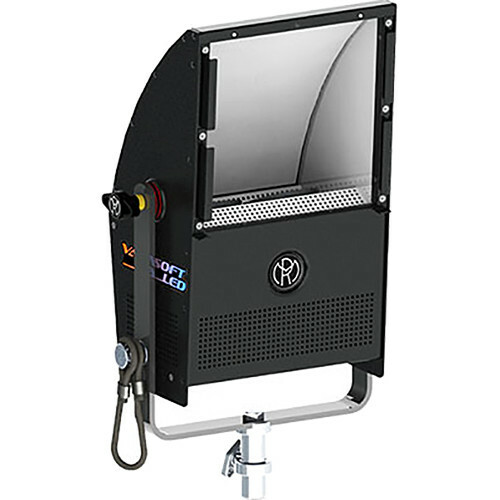 With an 8 x 8" aperture and a 95% reflective white painted aluminum reflector, the pole operated 200W Vari-SoftLED Variable-Color Softlite from Mole-Richardson will produce a shadowless wrap around light with a smooth field with a quality of light similar to that of a 1000W tungsten fixture. This model utilizes two 100W LEDs and has a variable color of 2700-5600K so that you can easily match different lights without needing gels or filters. Also, it has a beam angle of 170° for wide coverage as well as both local and DMX512 dimming from 0-100%. The fixture is constructed of aluminum and has an IP30 rating for durability as well as a yoke for mounting. Also, it utilizes passive-forced air cooling and runs on a universal 90-250 VAC power supply.